So, I was sitting on the chairlift last weekend at Laurel Mountain here in Western Pa. The rain was sheeting off my helmet and cascading down over my goggles and I noticed that I was the only one on the chairlift. Looking back to admire the view of our beautiful Laurel Highlands there was no one behind me or in front of me and I turned back around and sat in silence. Even though the weather was foul, I was protected in Pro Gore- Tex and thought about all the times in my life I have sat in silence on a chairlift while skiing. 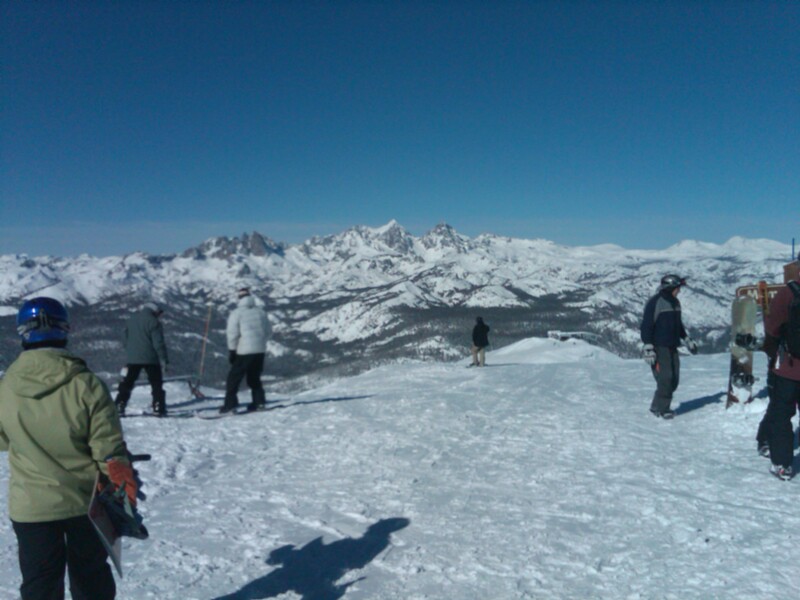 Truth be told, we spend way more time on the chair than we do skiing so what is it like? Personally, I like skiing by myself sometimes. On foul weather days, I can ride the chair in silence and contemplate the scenery around me and most of all…..take the time to think about things. One of the nice things about enjoying your own company is that you can relax and not have to wait or meet up with anyone. Not that I don’t like to do that with friends, but silent times on the chairlift are therapeutic to me. Kind of like riding a mountain bike by myself. I talk to myself…..sometimes I get answers. 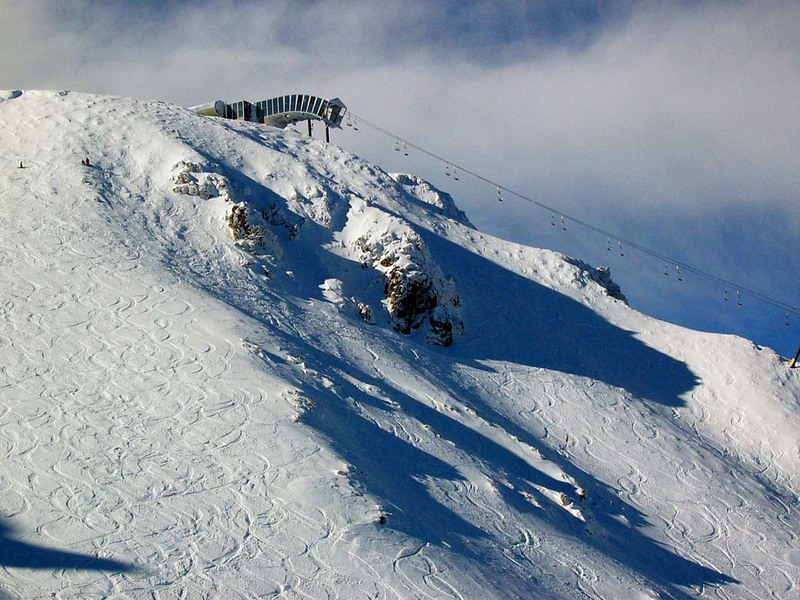 I have skied in 108 different areas so I have ridden a lot of chairlifts in my time. Single chairs at Mad River and Stowe, fixed grip chairs with no safety bars at Aspen Highlands and Crystal Mountain, with short seats that scare me, and of course my main nemesis that I ride annually out at Mammoth- the infamous Chair 23. I have posted about that before and when you have a four person chair, with no safety bar, suspending you hundreds of feet in the air over a wide expanse, people like me who are a bit acrophobic, tend to do the Archie Bell and the Drells and do the tighten up. But I get through because it is the only way up. So, what happens when other people are on the chair with me? Friends engage in conversation about the day and what is happening in their lives. 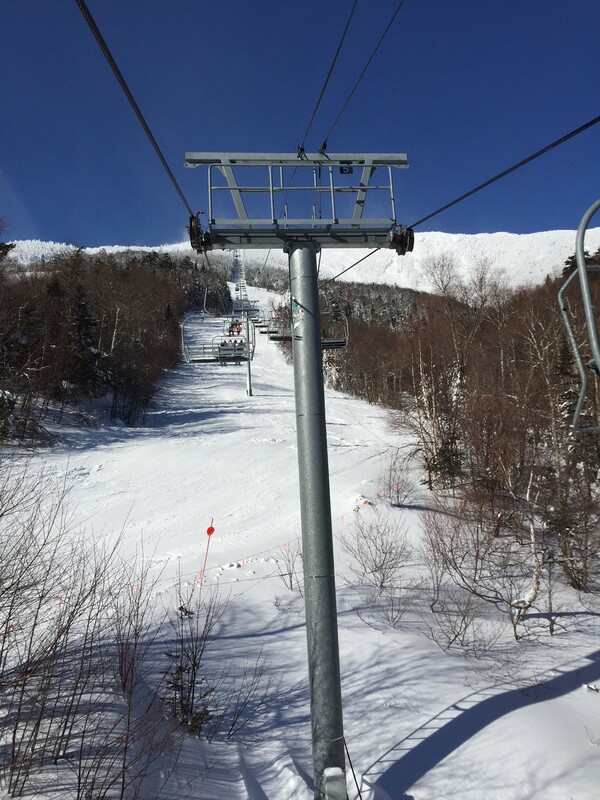 It gives us all a chance to catch up and the social aspect of skiing is always enjoyed on the chairlift because …..well, as I stated, we spend the most time of the day there. The funny thing is when you sit with a stranger on the chair or a group of folks who you don’t know. Depending on my mood, I can sit there and say nothing, nestled behind my high collar and goggles. But in most cases, I usually chime in and say at least a cheery “Hello- great day huh?” That usually elicits some kind of civil discourse and oftentimes you meet interesting people and find out how their day is going, where they are from, what they like about skiing at an area, and then you hit the exit ramp and never see them again. Then there are the ear bud types who play their music and just want to be left alone. Sometimes they look up and give you a loud, ” Hi. ” But most often they nestle behind the collar and the goggles and keep to themselves. That’s cool. You hit the exit ramp and never see them again. Late next week I hit the epic snows of the west. No more chairlift riding in the rain for me this season, but even though we have had a dismal winter here in the east, tenacity wins the day and one of the benefits has been time alone on the chairlift. I can look around, use the time to take in the beautiful mountain scenery of the Adirondacks, the Laurel Highlands, and on to the breathtaking vistas of the west. I will be hanging on for dear life on Chair 23, with my friends laughing at me all the way. But I won’t ride that chair by myself- that’s for damn sure. 🙂 Thanks for reading. 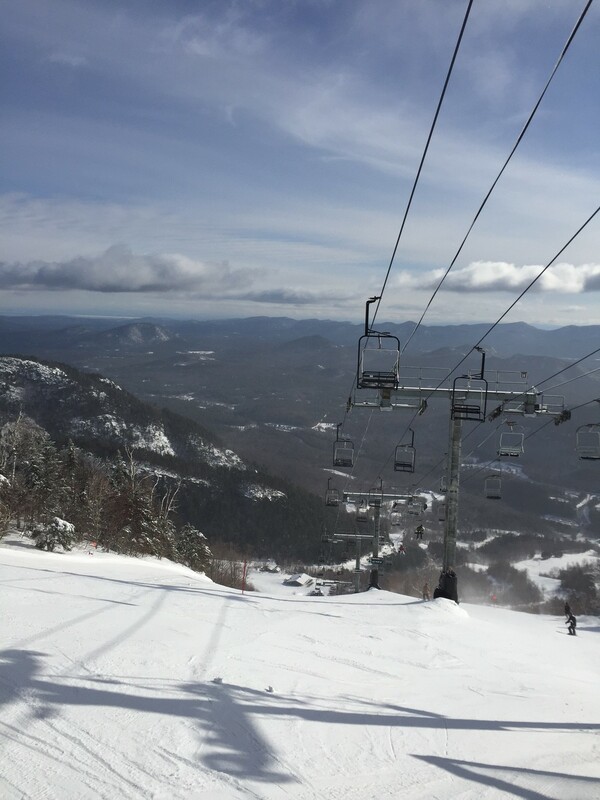 This entry was posted in American Culture, Friendship, Humor, outdoor activities, outdoor sports, Outdoors, Skiing, Weather, Winter, winter sports and tagged Laurel Mountain Ski Area, Mad River Glen Ski Area, Mammoth Mountain Ski Area, Stowe Mountain Resort. I love being in situations where you have to just sit and be silent. That is why I like driving on road trips. I don’t necessarily like just sitting in silence and not doing anything as I can’t help but feel that I am wasting time. However, if you are driving (or on a ski lift) you are accomplishing something, but have no choice but to sit in silence. It works out for my wife an I because she loves to nap on car rides. She takes full advantage of my ability to turn the radio all the way down or even off by sleeping away the hours. However, she is the opposite when she drives. She needs constant distraction. She doesn’t have a fiber in her body that allows her to just sit and think. I don’t have any real direction on this response, so my thoughts are astray. As a kid, I loved getting to the bottom of a sled hill and just rolling off of the sled and laying there looking up at the sky and listening to sounds of silence of nature. Winter always seems so much quieter than any other time. I hope you could take something away from my maze of nonsense. Great post by the way (last week too!). A quiet time on a solo chair ride can be awesome for sure. I think I’ve become a more social rider though since I’ve been out here. Awesome post! Thanks Art. Keep livin the dream. Great post. So True. Currently snowing in Ellicottville. Keep it rolling Sean. I am in Tahoe and headed to Mammoth.